Many of the toys. primate enrichment devices, monkey diaper covers and clothes used by primate owners are handmade. Thanks to social media, the creators of such products have the ability to market their products to a limited community. Unfortunately on social media your audience is very limited and as a buyer, it can be quite challenging to figure out who is selling what, plus can you really trust the seller? Primatestore.com is trying to close that gap. At Primate Store everybody can create their own shop for free. There is no startup cost, no monthly fees and no listing fees. You only pay a small fee when you actually sell something which gets automatically subtracted from the order together with the typical credit card fees. Opening up a shop within Primatestore.com doesn’t really take much effort and every time you list a new monkey related item for sale, those items are also automatically shared on the PrimateStore.com facebook page. Customers can rate the seller and individual products they purchased which will over time clearly show which sellers can be trusted. If you’re being serious about making money in the monkey world, you should consider creating your own shop within primate store. 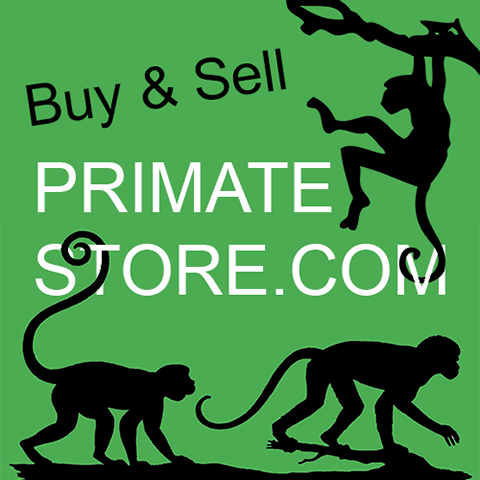 Primate Store is ranked high on search engines and they’re engaged in attracting more customers to their site. On top of that, they’ll gladly help you with starting up your own shop. Previous Entry: Are you thinking about adding another monkey into your life? Previous Entry Are you thinking about adding another monkey into your life?